Madi came back safely from surgery. They took out her external shut and put in a new internal one. 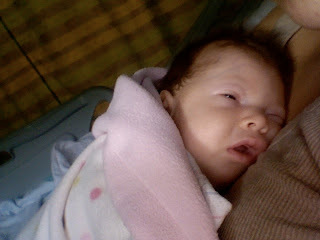 She's now five weeks old and has had four shunts (her first one, two external ones, and the one she has in now). She is in quite a bit of pain so they gave her morphine to help her feel better. She's not very interested in food but is resting quietly on my chest. I did try to breastfeed her and, when that did not work, tried giving her milk out of a syringe. My biggest prayer was that she would come through the surgery safely. Now that she has done that, I'm praying that her shunt will stay infection-free, will stay placed correctly, and will continue to function as it is supposed to. I am so thankful that God has protected her. We are hopeful that we will get to head home tomorrow. I couldn't ask for a better Christmas gift! Praise God for a successful surgery and we'll continue to pray for no complications and for her to be pain free. We are so relieved to hear that the surgery went well. We will keep praying for your special little girl. Have a Merry Christmas!